Let’s just start with the obvious, on Celebrity Apprentice – we ALL know Kenya stole that phone AND tweeted that mess! She didn’t fool anyone at that table. I believe based on the show so far, that Donald was keeping her for the drama, but once he realized she had stooped too low, he had no choice but to fire her. WOW! What nerve. I have never cared for her, but, to pull that? And on Vivica Fox? I saw her pushing Kate Gosselin around, but, Vivica? She wasn’t going to put up with that mess! I think just for a wonderful clashing of egos, one task event, they should have teamed up Ian and Geraldo! lol That would have been a nightmare! Although I do have to say I was so surprised when Geraldo finally had the self realization that he can sometimes press too hard, that gained some respect back in my book. Who knew Leeza could handle him so well?! She was a pro with him, she didn’t get his ire up like Lorenzo had in the past, but, she got him right in line! WOW! I did not see Donald’s house cleaning coming! I was shocked when he fired the whole team! I am sure Donald will take Geraldo to the final, unless he colossally messes up – I think Donald respects him too much to fire him, so, maybe Geraldo and Leeza in the finals? Ok, on to Vanderpump Rules. Well, Kristin has stepped into Stassi’s shoes being the whole judge and jury to everyone else, only Stassi stayed above the fray so she could look down on everyone and Kristin is right in there making the same dumb mistakes the rest of them are making. I am being more and more impressed with Katie lately! I guess her standing up to Stassi has given her more confidence to stand up to Tom. Maybe it was the talk Lisa had with her a while back… either way, good for her! Tom seems like a coward, he is always backward and timid and apologetic… hmmm… maybe it’s just his guilt shining through. He can’t stand up to Jax in front of Katie for fear that all of his secrets will be exposed, yet, he can’t stand up to Katie and fight back (mainly cause he doesn’t have a leg to stand on) , but, he keeps cheating and wanting to keep her as his girlfriend. I don’t think I will ever understand that one. These guys need to stop vacationing without their girlfriends, OR they need to break it off and then do whatever they want, but, they want both and it’s never going to stop… these girls should wise up and start over. I do have high hopes for Ariana and Tom. I like them together, hopefully he doesn’t screw it up! I just can’t believe that Kristin is with someone else and she believes that if she can break up Tom and Ariana she can have him back… what about James, and when is he going to put a stop to it? Maybe he just wants the tv time? Jax, Jax, Jax…. Why does anyone believe him… ever? He couldn’t even own up to Kristin that he told Schwartz that she saw the text… there’s no reason NOT to tell her… He lies for NO reason! lol So dumb. How can Kristin sit there in her meeting with her bosses and say she didn’t orchestrate the Miami girl thing? She’s ON CAMERA telling her IN Sur what to do! I mean how dumb can you be?! So happy that Lisa finally fired her for her behavior AND banned her from Sur – wow… The kitchen staff were thrilled, too! I do not think there was this much celebrating when Stassi left, and that’s saying something! 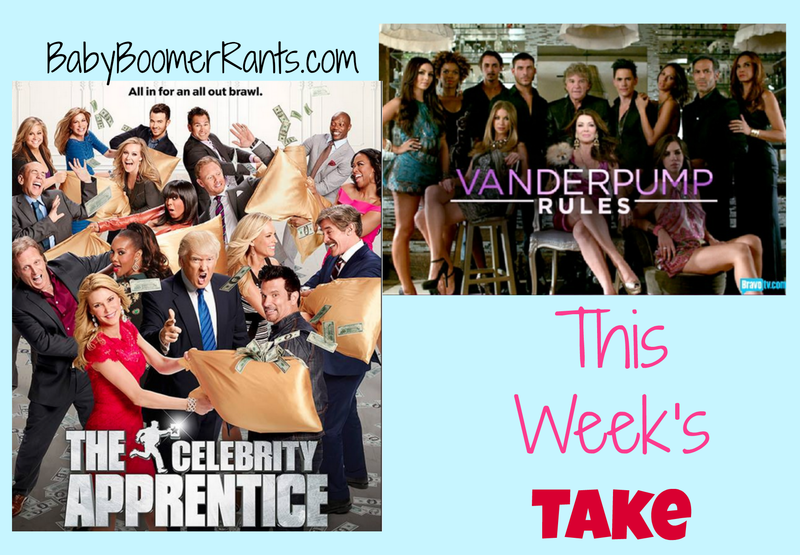 So, that’s my take on The Celebrity Apprentice and Vanderpump Rules this week, what did you think?